Ironically, Rick Astley starts to sing ‘Let it Rain’ on the radio. Brollies appear as people start returning to their caravans after a walk. People rushing to fill aqua rolls and empty toilets before it gets any heavier, lowering their heads against the rain drops, we all do it, a vain attempt at trying to minimise how wet we get. Blue skies have been chased away and replaced by gloomy grey skies. Dogs still need to go out, they don’t mind a bit of rain. Off they trot tails wagging, almost smiling as the rain has brought cooler temperatures, whilst their owners rush behind them pulling the hoods of their waterproofs down over their eyes, praying that this is going to be just a quick wee, hoping that their pooches don’t want to stop and sniff every bush and blade of grass. Flip flops have been replaced by a covered shoe as people scuttle to wash their pots after dinner at the facilities block. Rushing back with washing up bowls full of freshly scrubbed pots covered by an already damp tea towel. Not me, I’m not getting wet unless I have to. I stand in the dry next to my little kitchen sink washing up watching the raindrops chase each other down the window. A childhood game that I played with my sisters, still a source of entertainment whilst washing up. 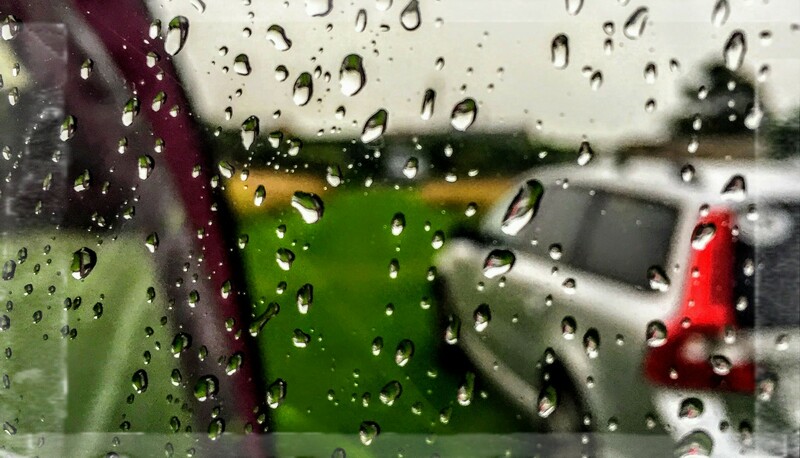 We love the sound of rain against the caravan roof, it reminds us of summers gone by when we were camping in a canvas tent. 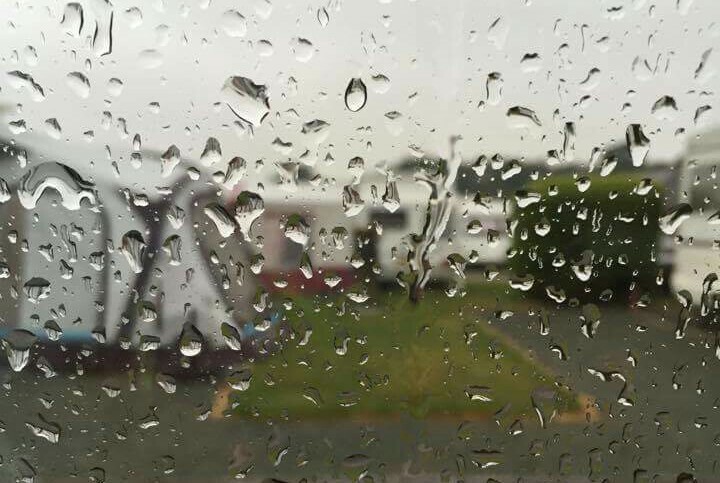 The tent, however, could only cope with about three days of rain before it surrendered to the elements and started to leak, in the caravan you are as snug as a bug in a rug and no amout of rain is going to make your home from home surrender … or is it? After a good nights sleep The Boss reached blurry eyed into the cupboard for his shorts to immediately exclaim “What’s going on, these are wet through”, sure enough, one leg looked like it had been dipped in a bucket of water. The source was very quickly located. 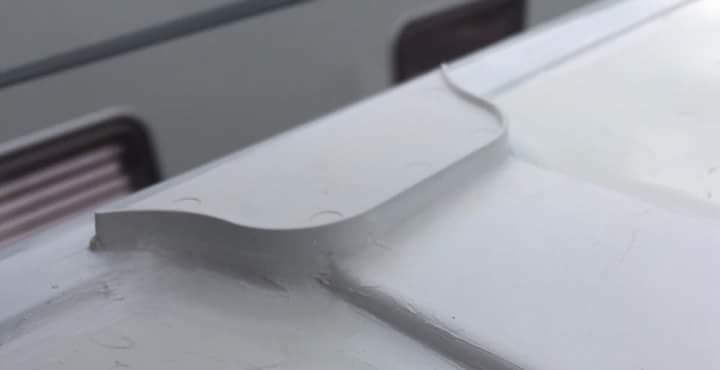 For some reason (any explanation would be gratefully received) our caravan roof has a join about six foot from the rear of the roof which has a seam externally and internally. The external seam acts as a water dam depending on the forward/backward tilt of the caravan, and is no better when perfectly level. Sticking a head through an open rear skylight did reveal a large area of dammed water directly over the leak spot. Luckily, it was departure morning and no further rain forecast, we dried the roof area and planned to get the ladder out back at the storage yard. Interestingly, we had recently seen numerous comments from other new caravan owners about leaks and the subsequent Warranty process, including cases where caravans have gone to the dealer and sat for months with no repair even started. Our opinion on this is that we want our caravan available to use, and if the manufacturer can’t make it water tight then how do we know the dealer can? The Boss hates parting with money and although his only maintenance training was watching his Dad do DIY in the seventies decides he will do a better job. A ladder is thrown up and one minute later we are looking at an appalling piece of sealant work on a caravan that was bought new less than two years ago. Call us naive but surely the roof of a caravan deserves better attention and who ‘passed’ this. A tube of Sikaflex 512 adhesive and sealant was ordered with next day delivery then back to the storage yard. The old ‘mess’ was removed with a Stanley knife then the area was cleaned and dried. A thin bead of sealant was applied before running a wet finger along the seam to finish the seal. Happy with the job but only a bit of rain will tell for sure. Two weeks later we are sat in torrential rain at Salisbury Caravan and Motorhome Club Site and so far we remain dry and the seal is holding back the dam. The manufacturer has contacted us regarding the ‘roof strap’. To answer our questions above; The strap covers the point where the front and rear sections are joined together, manufacturing restrictions prevent the creation of a single front/roof/rear panel which would also be subject to extra stress as a stand alone piece, plus the join near the rear of the caravan enables easier replacement in event of rear impact damage. More important to us was the opportunity to see a cross section of the roof and roof strap assembly. 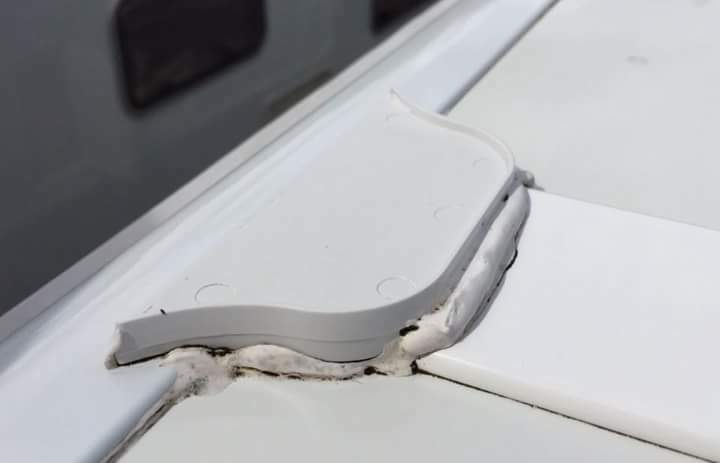 To reassure anyone with the same problem on a caravan with this set up, if you experience water ingress beneath the strap there will be no hidden damage due to water travelling unseen – there are no cavities within the roof or walls, it is one solid section. It is a question of getting it repaired before damage occurs to the internal wall cupboards. Repair is advised via the dealer and warranty process but you may also wish to seek approval if you feel a DIY temporary repair would prevent internal damage prior to warranty work. OMG! I guess even I can do it better than the “pro” workers in the factory! Your job looks much better! I hope no rain can get through! Today is first major test Ilze, 9 hours of heavy rain and we are still dry. Need to catch up with your blog, did you enjoy Germany? It is interesting what you say about quality control, it seems far inferior to the car trade despite similar outlay. The prolonged delays for warranty work that many report just increase customer mistrust and result in self repairs and unreported faults. Despite this, yes, we love our van too. Thanks for sharing your experience. This is my major worry after taking delivery of a new Vigo in February, so far so good but I have little faith in the build quality of our caravan industry. From what I read on other forums there is no end of line inspection, we appear to be it, why are we paying hard earned money for a PDI when we find so many faults. It does seem to be an industry where quality is only as good as the individual on shift, the lack of quality inspection then pushes the consumer down a messy warranty process. I would advise regular checks on your roof joint seals as dammed water will collect in these areas regularly. Goodness, you’ll be checking your seals every week now. It is important to feel safe [and that includes being dry] in your van, it must have been such a shock to wake up wet! Hope all is well now. Luckily we can pop our heads through skylight if we stand on bed, so roof will now be part of regular checks.